The producers of the coin say that it is in high demand abroad. 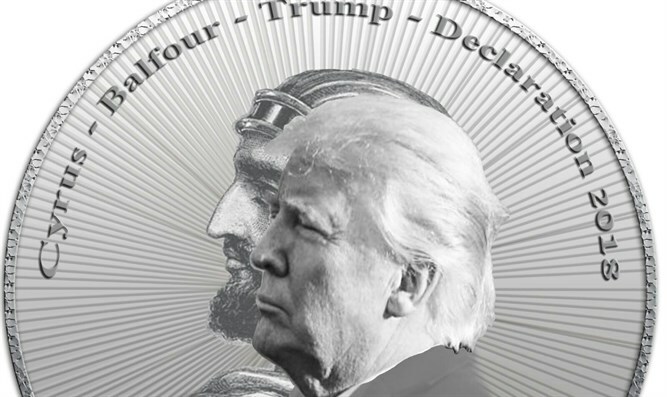 Prof. Hillel Weiss, Chairman of the organization “Hamikdash Betzion” (The Temple in Zion), says that the motivation to embed the image of the President of the United States on the coin is gratitude for his support of Israel and especially for the recognition of our sovereignty over Jerusalem.. "This is a historic act for which the Jewish people is grateful," says Weiss, who believes that the declaration sets off a process at the height of which the Temple will be rebuilt. On the other hand, warns Weiss, the coin is a reminder of what happened to those benevolent kingdoms when they turned back from their great declarations. Cyrus, in the language of the sages, "missed," was swayed by factions opposed to building the Temple and halted its construction - and only ruled for three years. And the British empire, which renounced and crushed the Balfour Declaration, was shattered as a superpower on the stage of history.